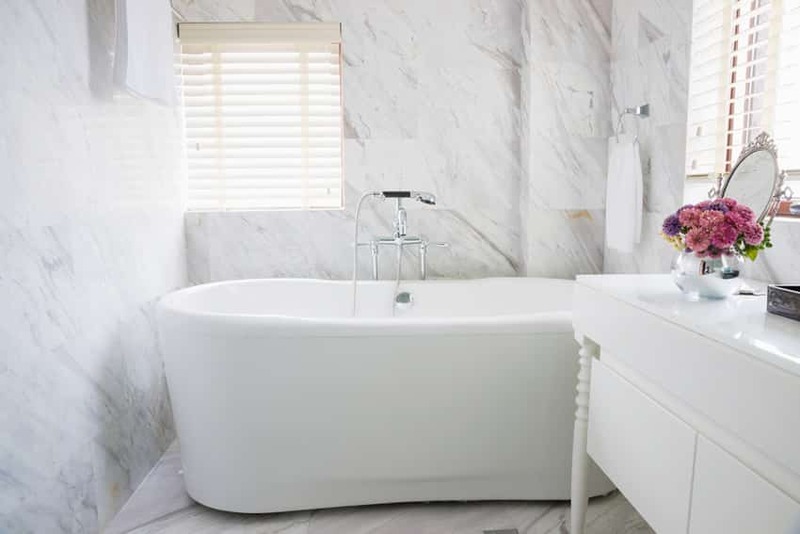 These bathroom ideas for small spaces share creative ways to make your room feel larger and get the most out of every inch of space. 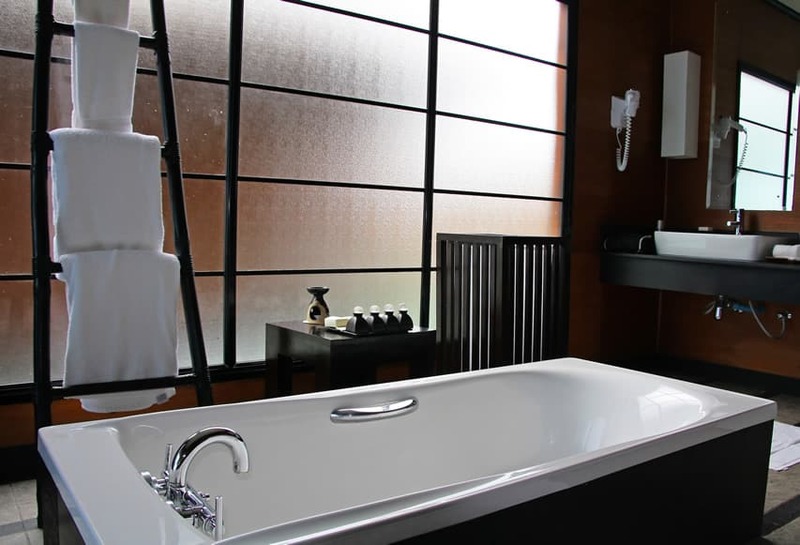 A small bathroom doesn’t need to feel so uncomfortable and confined. Whether its changing the paint color, adding a different vanity, or swapping out a bath enclosure there are many ways to get more space out of your small bathroom. 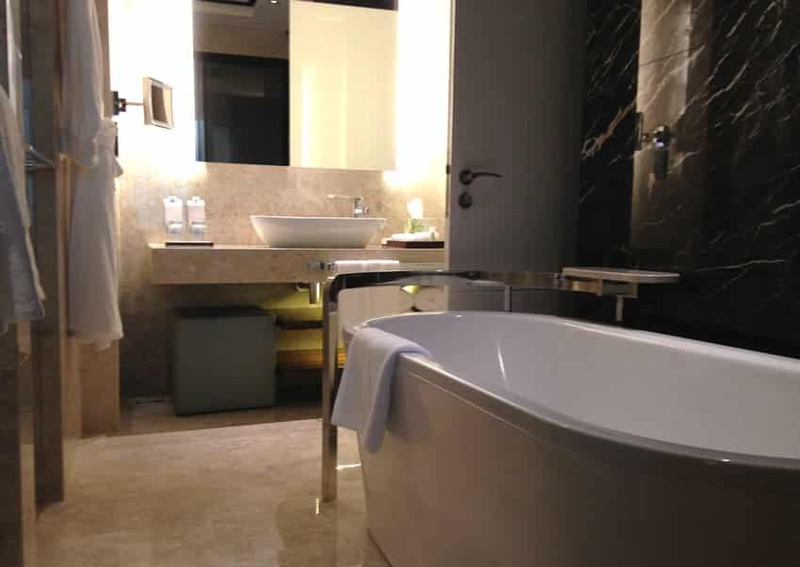 Use a neutral color scheme – Soft whites, neutrals and pastel colors can make a bathroom feel much more roomier as well as brighter as they reflect light easier. By using the same tones and color value for cabinets, trim and woodwork they can blend together to work to expand the space. To keep things from being too bland use accessories with bold colors, art, or linens to energize and add effect. Paint the ceiling to match the walls – Using a unifying color scheme will help the space expand visually. One trick often used is to go one shade lighter on a flat ceiling as they tend to look a bit darker than walls. The overall effect will be to cut down on the number of number of transitions to give the illusion of a more expansive space. Match tile color with the wall color – Using contrasting colors can give the appearance of cutting a room in half. To keep a small space looking as large as possible avoid contrasting colors and use a blended approach. Another tip is to run tile in the shower all the way to the ceiling to avoid any transition and cut down on contrasting lines. One more trick is to add glass tiles to create a shimmer and extra depth. Add a clear glass shower surround – Ditch the traditional shower curtain and try adding a clear glass surround to your shower to open up the space. Using a sliding, or pocket door is another great way to maximize your precious space. Try adding glass shelves – Along the same lines as the glass shower you can increase the sense of space in your bathroom by adding glass shelving. 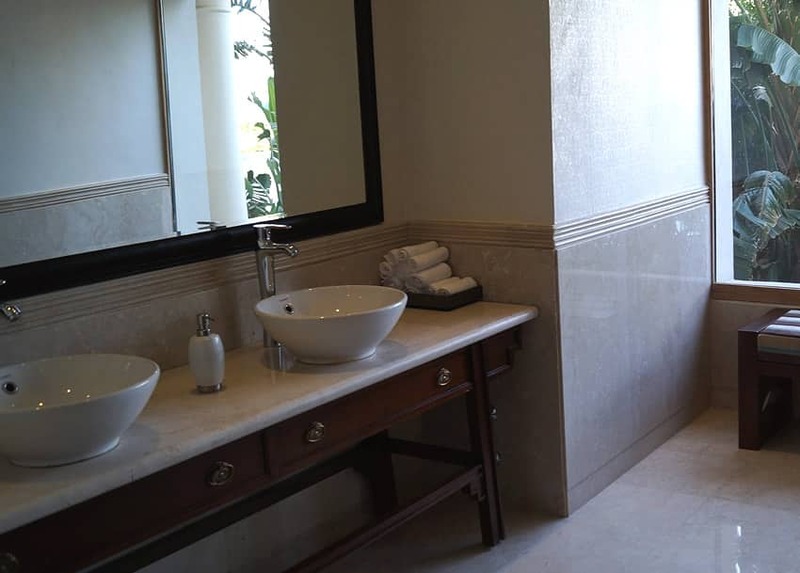 Install pedestal sinks – Putting in a pedestal sink can open up the space. 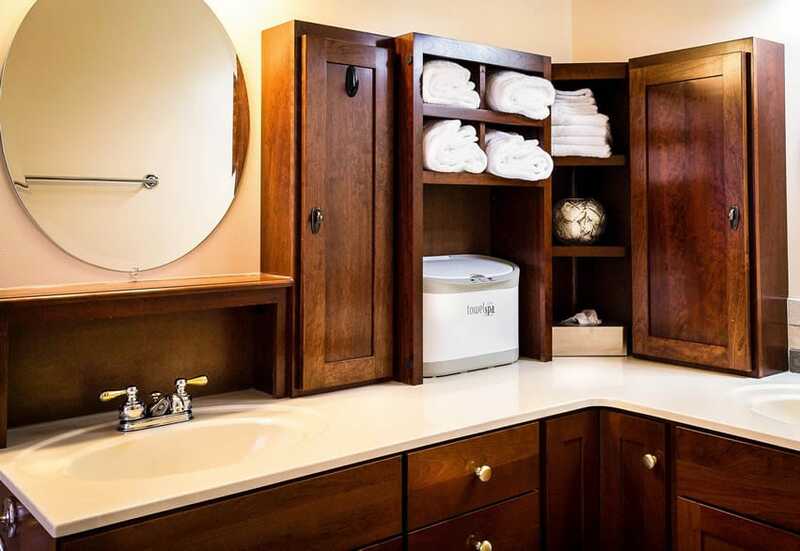 Going from a traditional vanity will provide you with more room underneath, but at the cost of storage. To remedy this try adding a tall cabinet to the side for your storage needs. Add a bathroom vanity with legs – If you do decide to go with a vanity cabinet try using a furniture style with legs. This type will allow you to see underneath for more depth perception and adds some airiness to the space. Many opt to use baskets under an open vanity to have plentiful storage for linens and accessories. Use cabinets with open shelving – Cabinets with open shelving feels slimmer. Another visual trick is to use a corner or curved vanity which will be less imposing. Keep storage flush with walls – Recessing your storage shelving in between the wall studs can give you more space to work with. This can help keep accessories tucked away to cut down on clutter and provide a cleaner space. Narrow shelving should be used whenever possible. 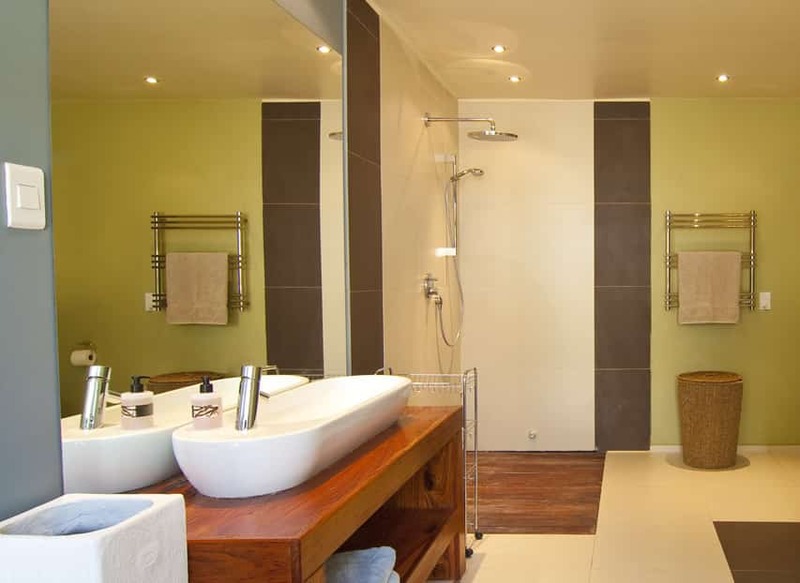 Add mirrors – Space can be stretched in a small bathroom by mirroring a wall. Mirrors can add depth perception and brighten a room. 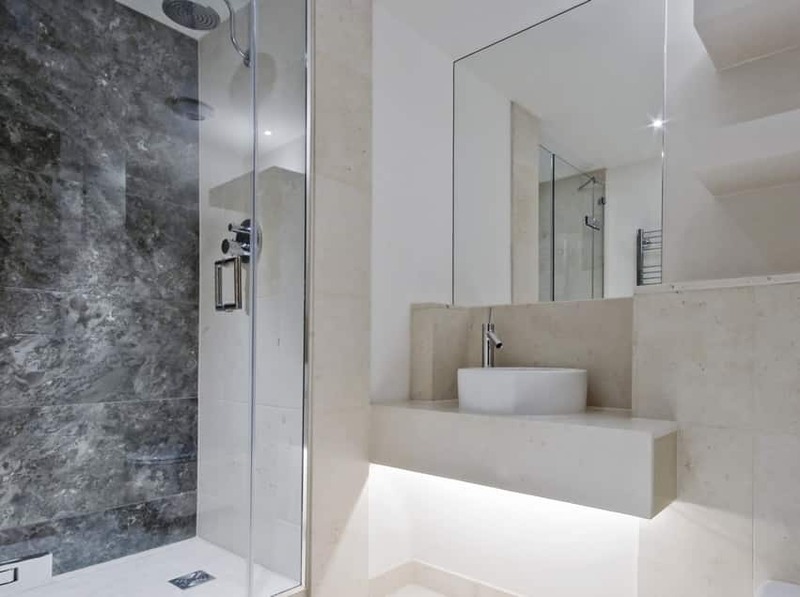 Mirrors that cover a bathroom wall and reach to the ceiling and are illuminated with lighting on top can really make a space grow. Use towel racks above the bath – Towel racks hanging above the bathtub make exiting your shower much more convenient and save on wall space at the same time. 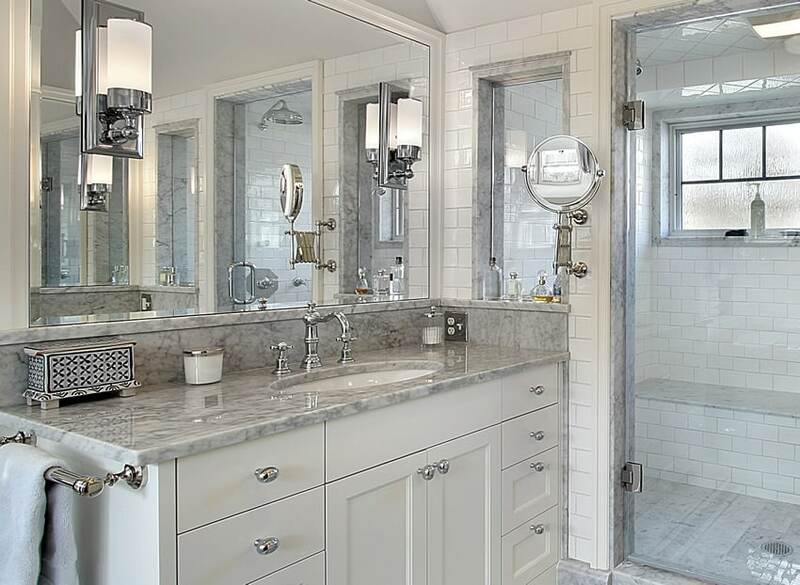 Towel racks can also be installed on the front of a freestanding vanity to save room. Use your windows – Nothing beats the feeling of natural light streaming through your windows to welcome you in the morning. Having windows uncovered always helps to brighten and enlarge the feeling of any room. If possible let windows transmit as much natural light as possible by leaving them unadorned or covered with frosted glass. Installing a skylight can also bring in natural light and offer privacy a regular windows might now allow. Cut down the clutter – Last but not least, when every inch of space counts try to remove any thing laying about. One of the cheapest and most effective bathroom ideas for small spaces is to store and get rid of items that aren’t necessities. 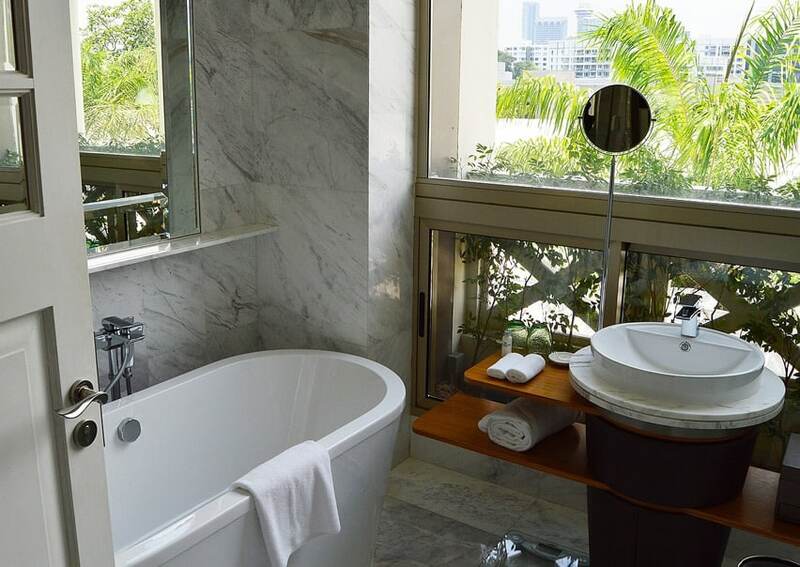 You’d be surprised how much roomier a bathroom feels when you clear off counters and get rid of extra accessories. This easy fix can refresh the area and make it aesthetically pleasing.